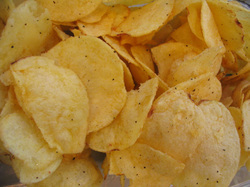 Chips, by any other name? It is doubtful that Jefferson would have described his French discovery as anything other than Pommes de Frites, but with a colloquially acceptable pronunciation, emphasising the place of his discovery. Hence, French Fried Potatoes, or the subsequently shortened phrase: French Fries. So, it appears that by the time half a century had passed, a nickname for Potato Chips had ensconced itself within American English. When George Crum, or whoever it was that christened the new found snack, considered a name - the Potato Chip was still available. As that is what it effectively is, going back four hundred years earlier, and he was the man to Eureka it, he was entitled to call it whatever he liked.